You are here: Home » Blog » Opinions » past glories » What did you do in the last recession, Daddy? ← First-Mover Advantage or Winner’s Curse? What did you do in the last recession, Daddy? We were sitting on a couple of packing cases in a Chicago convention hall chatting about what we’d like to do next. Gareth had started a software company a few years before and had created a 3D animation package which ran on hardware made by the company I was working for. It had been involved in an unrelated patent battle which was finally going to put it in its grave and me into redundancy. The conversation ambled along as we killed time waiting for the shipping boxes to come out of storage so we could pack up and head off to the bar. Slowly our conversation drifted from the fun stuff we liked to do, to a sketch of a new product we could build. I had been developing ideas for how a next generation paint system could be built, in software, in such a way that it could automate lots of repetitive tasks. I’d seen how useful this was when using proprietary systems to create news graphics at ITN. Gareth was keen to go it alone with his software company, running his 3D product on the latest Silicon Graphics hardware. We realised that a 2D system could be built for the same platform and that would double his product range. There were some important technical innovations that made all of this possible; the latest CPUs were suddenly fast enough, SGI had produced faster graphics engines, RAM was now big enough to hold images in memory rather than in dedicated display buffers. We knew that the products would meet a need because we had both watched users wasting huge amounts of time using Paintbox to do their digital graphics by hand. What we didn’t know for sure was whether it was commercially viable, but hey, I was going to lose my job and my wife was about to have our first child; what did I have to lose? We were right. There was a market. And it was ready for our innovation. What suprised us was that it was a market we didn’t even know existed. Soon after we had brought the first version of Matdor to market we were at the same tradeshow, demonstrating to anyone we could attract to our tiny stand. One customer sat down and I started ripping through my demo. He soon interrupted me; “so what size images can you edit?”. I explained that although TV images (the only ones our customers edited) were only 720 pixels across, we’d made the software be able to handle any sized image so that you could do things like panning backgrounds. The other reason we’d done this was that we could. He asked me to show him. That was a red rag to a bull; I loved being asked to improvise in demos. That was Tom Williams who had recently joing Industrial Light and Magic as a Technical Director on Terminator 2. At the time ILM had one of only two scanners capable of digitising film material in the world. It was the start of an incredibly creative and productive relationship which had us develop Matador to edit film resolution images and operate within ILM’s unique workflow. A couple of visits to “Kerner Digital” (the discreet sign on their mundane front door) later and I was ushered into the darkened room of one of their animators. “We just want to show you some tests to see what you think”, they explained. I looked and saw a wireframe T Rex lolloping across the screen. We worked hard to make Matador the most useful tool it could be for them. Tom challenged us to make it possible to double the productivity of their matte painters; we increased it 6 fold. In return they trusted us by using it on Jurassic Park and dozens of other movies. 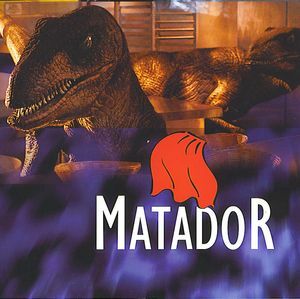 In fact, Matador was used on every film that won the Special Effects Oscar for a decade. This entry was posted in past glories and tagged design, Matador, mentoring, product. Bookmark the permalink. 5 Responses to What did you do in the last recession, Daddy? Not sure about the requirement for a ‘matte’ painter in this recession…I guess Gordon B would prefer you to ‘gloss’ over his blunders! It is a time for opportunity, indeed. Money cleverly spent now will reap rewards once the economic confidence is restored. Recession is not an physical illness, more a mental instability. With a little therapy we’ll be right back on track. The therapy is courage and innovative thinking which will lead to renewed optimism and confidence! What recession? Thanks for your comments Babs, yes optimism has to be one of the keys for getting through this mess! January 1999. It’s simple and for many tasks quicker than Photoplop to this day. Photoshop is cluttered and over complicated for many simple tasks. Having Matador integrated within a compositor ( Illusion ) improved things further. I can’t understand why leading composting platforms to this day have such weak integrated paint tools in comparison to over a decade ago. I told him that it was a dead system and I was going to get rid of it soon anyway. That is so cool. The real sadness is that when Avid finally pulled the plug on the development team we’d been working on a replacement to Matador. Taking everything we’d learnt about how people wanted to use it and put it into a truly layer and vector based system. Oh well! Maybe you can send me some screen shots so that others can reminisce too? I got a nudge from Chris and had to add a comment. I very much would like to get my hands on a MIPS/irix sgi emulator running Matador/Matador 3D (née ‘Acrobat’)/Media Illusion.. Old friends!